Jewelry Making Instructions Sitemap will serve as an easy reference point for you to search for any page or topic within this site. Just scroll down the contents of this jewelry making website and you might be able to find out you are looking for. Just in case you still cannot find what you want here, you might like to use the Search software just below here or at the end of this page. Just enter what you are searching - a word or a combo of words - and click on the Search button. Jewelry Making Supplies - Essential tools ad supplies for making your own jewelry pieces. Charm Bracelets - Everyone loves these bracelets; even celebrities. You might spot them wearing one either on a tv program or a movie if you are observant enough. But once you are hooked onto jewelry making, you will see these everywhere. Don't know how to make? Here are basic techniques for making your own findings to make those beautiful pieces. 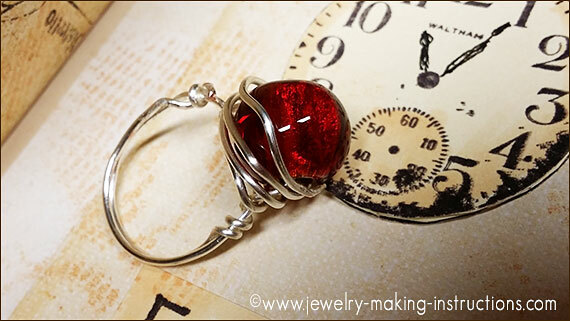 Online Jewelry Making Videos - Free Jewelry Making Tutorials. Making Earrings - Some basic rules and pointers to help make a comfortable pair of earrings. Earrings - some projects I created to inspire you with step-by-step instructions. Anklets - Measure your ankle and make one that feels comfortable and wear it around town. Here are some design ideas for you to jump-start your anklet making fun. The colour of turquoise goes so well with silver findings. Do You Know Your Pearls? Natural, Cultured or Imitation. Also included instructions on caring and cleaning your pearls. Have fun throwing a party and include jewelry making for kids. Even boys love to make jewelry. These will keep them occupied and entertained for a while.